Angela Conant (AP ‘13) and Sarah G. Sharp (AP Faculty) are showing work in the 2019 Flat Files Exhibition at the ICA Baltimore. Angela Conant (AP '13) presented the "Second Annual Opposite Day" at AGENCY in Dumbo, Brooklyn tonight, December 18 at 7pm. Angela Conant graduated from the MFA Art Practice program in 2013. In her recent work, Angela repeats content through paint, video and stone, parodying the politics of gender and media. 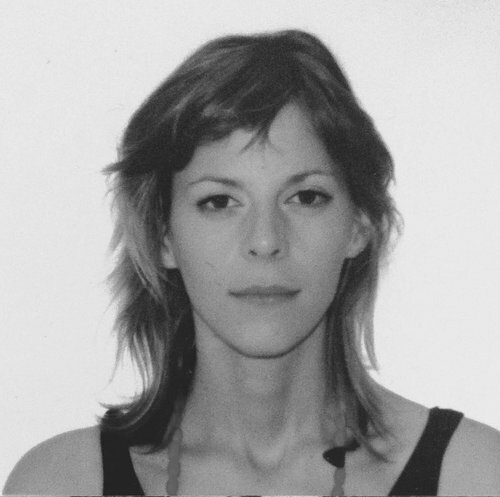 Her practice also encompasses curating and collaborating on artist-run projects. She is currently a visiting assistant professor at Pratt Institute. We catch up with Angela here. I made three works on paper by taking rubbings of my recent marble sculpture. I made a sculpture of a face with the eyes, mouth and nose raised and flat expressly for the purpose of making rubbings. I am working on a series of three of these marble faces, so that I can make rubbings that will be portraits made of a mixture of all the various combinations of facial features from all three sculptures. I am going to show the three marble works up in Newburgh, New York at an annual outdoor sculpture show organized by Lacey Fekishazy, director of SARDINE Gallery. I will accompany the marble pieces with a large sheet of paper and wax crayons so that people who attend the show can add rubbings to what will become a large collaborative, participatory drawing. I'm not making this up, but it seems unbelievable since it is a piece of writing that is influential to me and my work: Joan Jonas: Cult of Lateral Thinking by Judith Rodenbeck (published in Modern Painters February 2007). I re-read it yesterday because I assigned it to my Pratt sophomore students this week. Rodenbeck adeptly connects Jonas to artists who influenced her, like Joseph Beuys, as well as those she has influenced, like Pipilotti Rist. I am especially interested in Jonas' use of physical distance, femininity, technological media and literary references, all of which the article concisely and properly describes. Most recently: the exhibition/print sale I co-curated at The International Print Center of New York, which opened this past Friday night. But also, last weekend I went up to the Studio Museum in Harlem and saw the artists in residence exhibition, We Go As They, including the first in a series of performances by Autumn Knight called Sanity TV, a talk-show-formatted piece wherein Knight invited audience members to sit on her lap and eased them into improvisational performances. Two "guests" adopted impromptu characters, one of a crack-smoking dog and another of a zoo gorilla who became famous for taking a selfie. I believe in art. I have a strong belief that art is a way, in itself, to articulate life, the world and existence as well as to propel or expand thought. I am motivated by the very moment of the expansion of thought, when an idea occurs as a result of context, the previous idea, the previous work, or another's work. These are only a few examples of the instances when an idea can occur. I am motivated when I see work made by fellow artists in any medium, because I am reminded that we each have a valuable perspective and that individual voices together comprise the shape of our time. It is likewise encouraging to know that others are reciprocally motivated by my ideas. I also like learning how to make things and experimenting with various media; I am driven to see my ideas realized in various forms, because until an idea is manifested, it is impotent. My practice changes frequently because my attention is not held by one medium or idea for very long. Working with unfamiliar materials helps me think of things to make, so I purposefully change my practice to encourage my thinking process. I studied painting in undergraduate school, so I was mostly working in paint and making works on paper, and then began working in sculpture and video after school. In grad school I learned how to apply research, thought and ideas to my work in a more long-form way. I also appreciate cohesiveness, so I combine my work in all these various forms into individual works. I use my own sculptures as painting references, and in my videos, objects I've made become props or characters. I most admire people who know what they want, and people who put their lives or livelihoods on the line for what they know is right for the greater good. Examples are Chelsea Manning, or Billie Jean King, the tennis player who made a spectacle of herself in the 1970's to raise awareness for women's and gay rights. This was within sports, but it was also very performative and constructed a lot like an artwork in that sense. A Becoming Resemblance by Heather Dewey-Hagborg in collaboration with Chelsea Manning, wherein Manning sent cell samples to Dewey-Hagborg from prison, and the artist had them digitally analyzed to construct images and ultimately 3D printed faces based on Manning's DNA. Angela Conant (AP '13) is showing work in "How to Draw the Human Figure" opening tomorrow at Agency in DUMBO.